This is the version that will work, Please give it a shot if you tried earlier with a 1.0 version that failed because resources were not packed in. By the time i realized that i didn't upload the resources files, the time was already up.. so please pardon my mistake. I've sent out an email asking richard for help, have to see how that pans out..
Well that was a roller coaster.. i really couldn't find the rhythm this pyweek, was struggling to write the branching story.. its' actually a game type i never tried before, i should have spent some time finding a tool for the conversation stuff, instead i stuck to writing the json file and it was hard to read it after a while to make sense of where i was going. Hopefully this is something i can figure soon. One good thing from my perspective is that iv'e gotten a framework for loading cocos creators' output into my game using cocos python. It's not perfect but its a good start :D Hopefully ill' be able to work on it further.. ill upload the code for that project separately, hoping there will be takers. Cant' wait to try out all the other entries. Have you heard of reigns game?.. well my entry is going to be very similar to that game. Hopefully the story i've got is funny / interesting enough for you guys to play and appreciate. Thought ill' share some screen shots of work flow iv'e got going on, as i invested a lot of time into it. 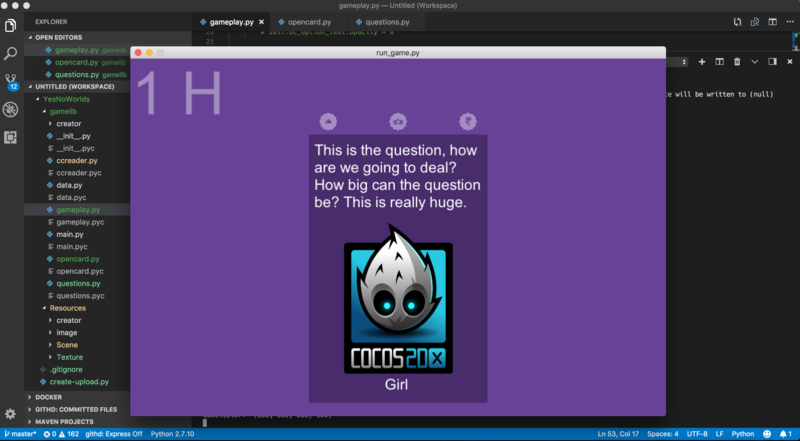 As you can see the view is pretty close to what is setup on cocos creator. This is good enough for me to get started. I've worked on getting the animations from cocos creator as well, but was not really able to leverage due to some bugs in the way the nodes are positioned on screen. Didn't want to spend time fixing it for now. 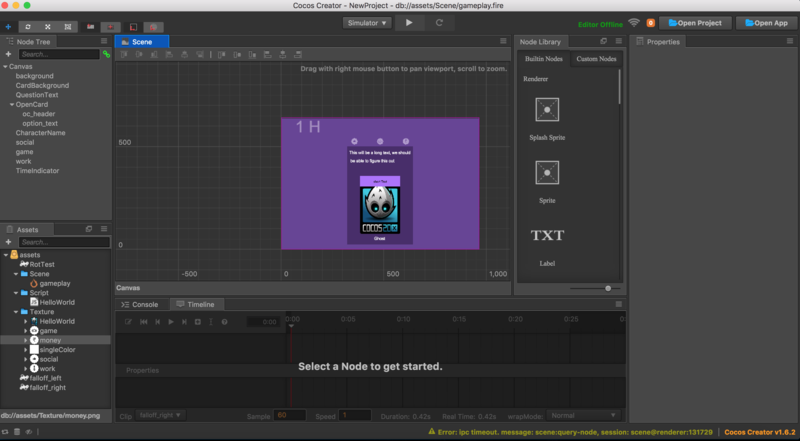 I setup my workflow around an editor called cocos creator. Wrote a script to be able to handle the scene creation and all but what I realised yesterday was that there are bugs in the editor plugin that I a. Using to export the scene. This could potentially be hard to recover from., Have to tread very carefully while editing a scene. Otherwise I've gotten the story in place have the features I'm going to implement listed out. Bare-bones gameplay is ready. Have to ensure I can get the story branching nailed down. I've been used to picking inkscape for my level design in some of my previous pyweek entries.